The Christmas Records Grants are key to supporting Special Olympics activities in Indonesia. There is not a lot of money set aside for people with disabilities in the country, and people with physical and intellectual disabilities are often grouped together. Until recently, people with disabilities were seen as the lowest-class citizens in Indonesia. This makes work difficult for Special Olympics Indonesia. But Special Olympics Indonesia has received over $360,000 in Christmas Records Grants since 2007. Since that time Special Olympics programs and competitions have expanded to all 34 provinces of the country. And other numbers are growing too. One of the Program’s main goals in 2011 was to register 100,000 athletes by 2014. As of 2013, that goal was reached and now they are hoping to have 150,000 athletes by 2018. Special Olympics Indonesia was able to identify, recruit and train 5,340 coaches in 2015. In addition, Indonesian athletes have competed in Special Olympics World Games in Los Angeles, PyeongChang, Athens, Boise, and Shanghai since receiving Christmas Records Grants.
" When families start seeing results [from people with intellectual disabilities], all these challenges are overcome with hope for the future." 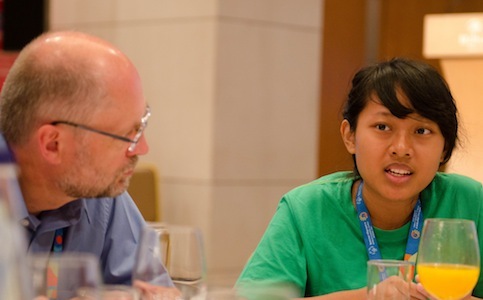 Special Olympics Indonesia also re-launched its Athlete Leadership Program (ALPs) in 2011. ALPs provides opportunities for Special Olympic athletes like Stephanie Handojo to increase their social skills and self-esteem. Stephanie is now an International Global Messenger (IGM) from Indonesia and one of two serving IGMs from the Asia Pacific region and she also serves on the Asia Pacific Athlete Input Council (AIC). At the 2016 Asia Pacific Leadership Conference, she joined her fellow AIC members to call on all Asia Pacific Program Leaders to activate Athlete Leaders, give them more meaningful leadership roles, develop strategies with them and not without them, use Athletes as the voice of the Program and match their abilities with leadership opportunities. Special Olympics Indonesia is gaining momentum, but “not fast enough” said Simon Koh, the Special Olympics Asia Pacific's Director of Operations. “When families start seeing results [from people with intellectual disabilities], all these challenges are overcome with hope for the future.” The continued support of the Christmas Records Grants will ensure that this hope is achieved.